This weekend, the Madden Challenge is pitting virtual football’s best against each other one last time before the championship in May. Though the players behind the controllers are pros, the quarterbacks in the game could use a little work. 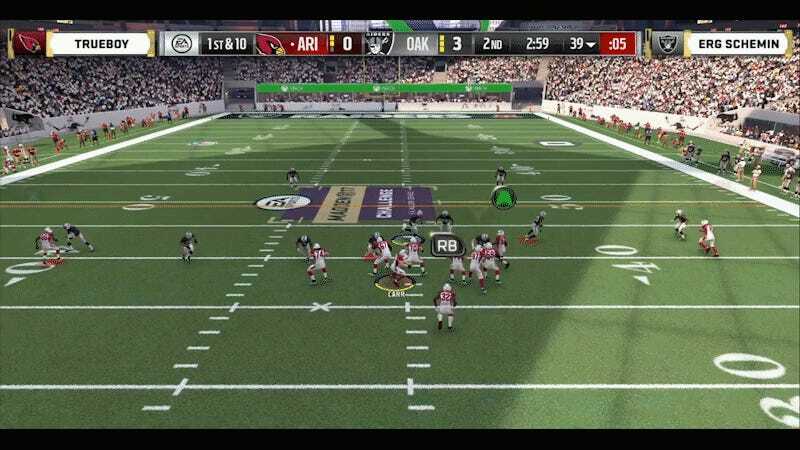 Tuning into the series, the literal first play I saw on stream had Eli “Trueboy” Clayton’s Cardinals pressing down the field against Mark Samuels, Jr.’s Oakland Raiders. Clayton seems to have, ironically, Derek Carr in the quarterback slot. But when Carr takes the snap, the halfback cuts across his path and ends the play a little prematurely. As the commentator advises Clayton to “stay composed,” it’s difficult to know how much of that was Clayton running the play wrong versus the game’s AI causing havoc. Either way, it didn’t matter too much, as just a minute of game-time later, Clayton found the opening he was looking for. Clayton shows off a little in that clip with his weaving cuts, pulling seven points out of a drive that started at the one-yard line and included one massive trip taken by his QB. Though he’s unhappy with his draft for the tournament, Clayton stayed composed and went on to take down Samuels, Jr. to advance to the semifinals. The Madden Challenge will be running for a good while yet today, and you can tune in to watch on Electronic Arts’ Twitch page or check out the NFL Network tonight for the championship match. I can’t guarantee you’ll see a bumble like this, but you might see some pretty talented Madden players and learn a few things for your next match.